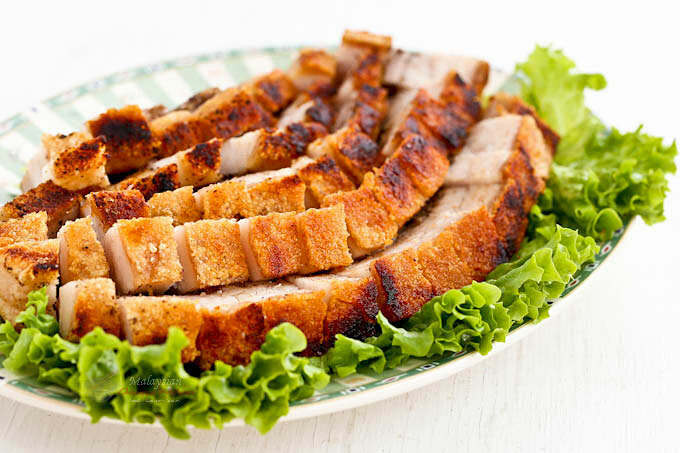 Easy to prepare Siew Yoke (Roast Pork Belly) with a perfectly crisp crackling. Delicious served with steamed rice and perfect for any occasion or festival. 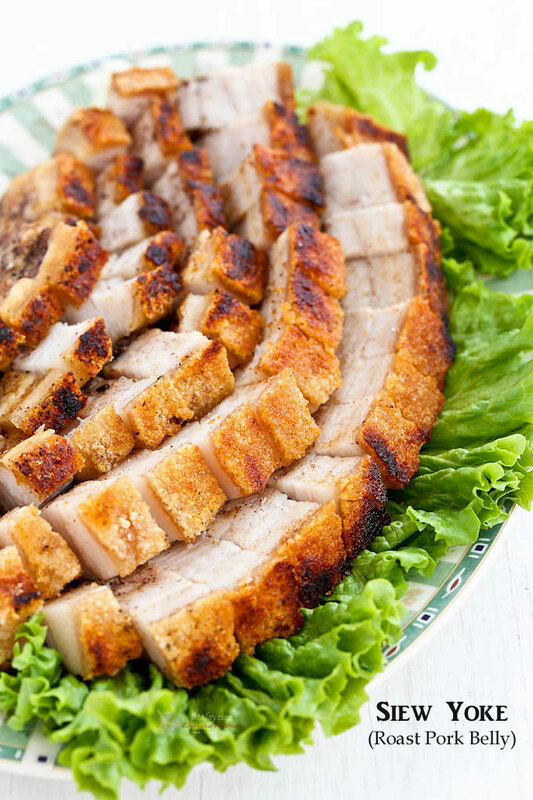 Even though Siew Yoke (Roast Pork Belly) or siao bak is easily available in Malaysia, it is still one of the most requested meat dish for Chinese New Year. Unlike Char Siu (Chinese Barbecue Pork), I have not seen it being offered at the restaurants here. Hence, the need for us living away from the mother culture, to prepare it at home. Well, I did it MY WAY. I would leave the meat to dry out uncovered in the refrigerator overnight. The next day I will roast it and finish off the cooking by placing it under the broiler to allow the skin to blister. It worked for me and my Roast Pork Belly turned out really well. I’ve been doing it this way for years. This time out of curiosity, I decided to give the vinegar treatment a try. I actually combined both methods but did not prick the skin as much. Not wanting to waste a perfectly good piece of pork belly (in case it does taste sour), I only added the vinegar just before roasting. I also sprinkled some kosher or coarse salt on the top for extra flavor and oomph! Scrape pork belly skin with knife to remove impurities. Rinse and drain. Bring a pot of water to boil. Blanch pork belly in boiling water skin side down for 5 minutes. 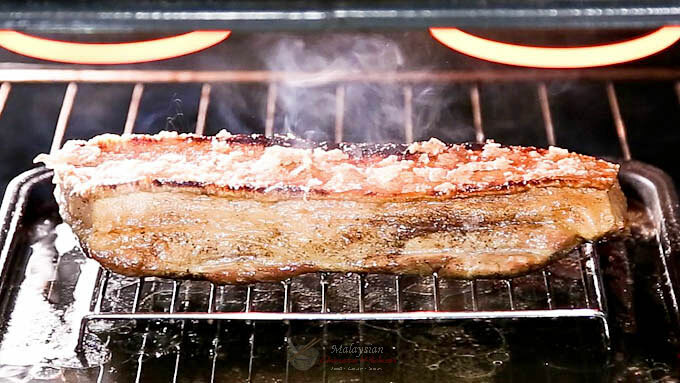 Flip pork belly and allow it to blanch for another 5 minutes. Remove and pat dry with paper towels. Combine salt, five-spice powder, and pepper in a small bowl. Place pork belly skin side up on a tray. Pierce the skin all over with a fork. Flip the pork belly over. Using a sharp knife cut several lines about ¼ inch deep and 1 inch apart along the length of the pork belly. Pat dry rub evenly over the meat and sides of pork belly. Place a wire rack on a baking tray. Transfer the pork belly skin side up onto the wire rack. Pat dry skin with paper towels. Allow it to dry uncovered overnight in the refrigerator. When ready to roast, brush skin with vinegar. Then sprinkle kosher (coarse) salt over the top. Pour just enough water to cover the base of the tray without wetting the pork belly. Roast in a 375°F (190°C) oven for 50 minutes. Remove from oven. Move oven rack with mittens to the top most level close to the broiler. Return meat to the rack. With the oven door slightly ajar, turn oven to broiler (grill) setting. The pork belly skin will start to blister. Continue to broil (grill) for approximately 5 to 10 minutes or until skin is evenly blistered. Remove when done. 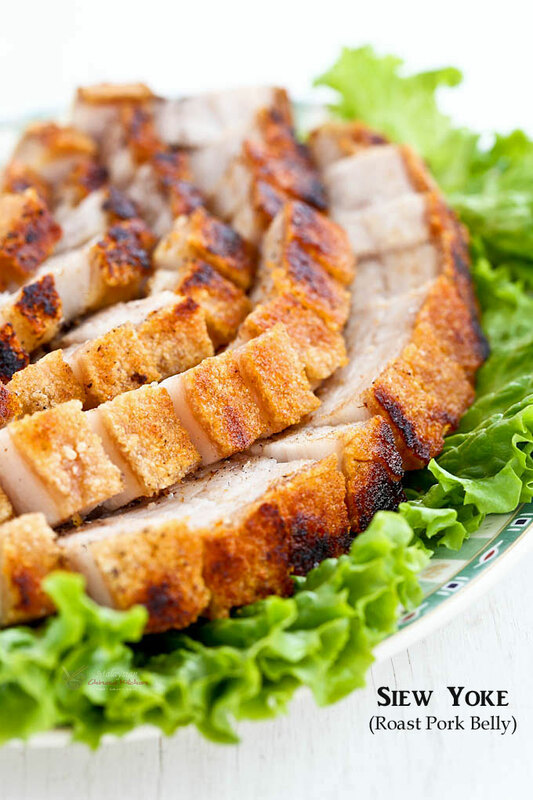 Allow roasted pork belly to rest for 10 minutes. Remove charred bits by scrapping with a knife. Cut into bite size pieces. Serve immediately with mustard and sweet chili sauce if desired. The crackling was perfectly crunchy! I hope you heard that crunch in my video. 😉 No sour taste whatsoever…phew! I guess there are a few ways to achieve that perfect crunch. Choose the method you are most comfortable with and give it a try. I know you’ll love it! I used this recipe to make it for one of our college food events and everyone loved it! It was a great way to introduce some food from home to my international friends. Thank you for sharing the recipe! You are welcome! Thank you for the kind comment.